Making your own vegetable juices will supply easily absorbed nutrients, enzymes, vitamins, minerals, protein and fats critical to cancer-proofing your body along with increased health and vitality. It provides both cleansing and healing. For an extra special health boost with anti-cancer properties, you can grow some wheat, barley or rye grass and add that to your juice. Juicing for health will improve your overall well-being and you will experience a vitality you never realized you had before. Your hair and skin will glow. Vegetable juicing provides your body with a very concentrated source of nutrients and enzymes. These help to detoxify your body and boost the immune system with high doses of vitamins and minerals that are easy to absorb. For maximum benefit when juicing it is best to juice on an empty stomach. You can manage any healthy issue or ailment you may be experiencing, your immune system will function more effectively and your digestion will improve. However, although juicing is extremely beneficial for your health, it does not contain protein and fiber. Juicing is in addition to your meals…not in place of them. Health problems are generally a result of our bodies being acidic rather than alkaline. Drinking a healthy dose of vegetable juice will help it to maintain the PH balance needed to maintain good health. 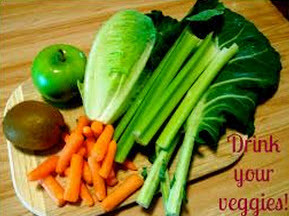 Juicing detoxifies the body and enables the cells to absorb and utilize nutrients better. When cells are on overload with toxins, adding more nutrients are of little value. The ability of vegetable juicing to detoxify cells is as important to overall digestion and health as the consumption of large amounts of nutrients and enzymes. Ideally it is best to make your fresh juice every day. But for most people this just is not reasonable. You can however make enough for a few days and store it in the fridge with only mild nutritional loss. The key is to put it in small containers that hold enough for one serving and have an airtight lid. Fill the containers to the very top as you want a minimum of air in the jar as the oxygen in air will “oxidize” and damage the juice. For those who have cancer concerns (and who doesn’t these days as it has stung most families in some way) juicing is right “up there” for cancer prevention. You can truly think of juicing as a sort of “health insurance” and the premiums are so reasonable! If you are to cancer-proof your body you have to invest some time into it. Anything worthwhile takes time, energy and love. A little time, a little effort, fresh veggies and a juicing machine and you have the formula health and vitality. Juicing is a win-win situation. Here’s a test that will reveal your risk for Cancer. Just answer a few simple questions in this short quiz to discover what your present risk is for Cancer. Knowledge is power. Take this quiz and find out what it is you need to change in your eating and exercise patterns in order to set yourself on the path to health, vitality and a cancer free life.